Chidambaram Temple: Located in the east-central part of Tamil Nadu, the town of Chidambaram is famous for Nataraja Temple. The beautiful temple is located in the centre of the town covering an area of 40 acres. Chidambaram Nataraja Temple is one of the most ancient and celebrated Shiva shrines in India. 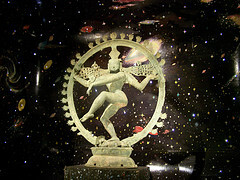 It is associated with Lord Shiva (Nataraja) in his Ananda Tandava (Dance of Bliss) pose. Chidambaram temple is of most religious, cultural and historical significance. Another unique feature of this temple is thisis one of the few temples where Shiva and Vishnu are enshrined under one roof. The supreme Lord dances not only in the cosmos, but in the mind of devotee himself. The workship of the linga form of Shiva in association with the five elements (earth, water, fire, wind and ether) is peculiar to Indian culture, which is a great contribution to the world culture. This is one of those rare temples that represent Lord Shiva in an idol form rather than a Lingam. The art and architectural lavished on the temple is just remarkable. Among the many legends associated with Chidambaram temple, Adhisesha, the serpent who serves as a bed for the Lord in his manifestation as Vishnu, descended to the earth as Patanjali to enjoy Ananda Tandava, the Dance of Bliss, by Lord Nataraja. The sacred dance is said to have performed in the Golden Hall of Chidambaram, witnessed by the gods and rishis. Lord Vishnu is also said to have enjoyed this. On either side of the gateways of the western tower of Chidambaram Temple, there are representations of the 108 poses of the classical Bharata Natyam Tradition as enunciated in the Classic Natya Sastra. Two annual Bhrammotsavams at Chidambaram are of great significance. They are Anithirumanjanam held in June-July, and Marghazhi Thiruvaadhirai held in December-January. During these festivals, the sacred shrine of Lord Nataraja is taken in a procession through the car streets, in the grand temple car, followed by a long anointing ceremony. These festivals are attended by large number of people. The Natyanjali Festival is dedicated to Lord Shiva and is held every year during February-March in the temple premises. It begins on the auspicious occasion of Maha Shivaratri and lasts for five days. During this festival, dancers from all over India, participate to pay their tribute to Lord Nataraja. Kali Temple is in the northern end of the town. Peechavaram, 16 kms away, known for its exclusive mangrove ecosystem is considered among few of the most scintillating scenic spot with overflowing natural wealth. Kalvarayan Hills 150 km north west of Chidambaram. Hotel Sharada Ram is a good place, which is near the bus stand. For more hotels check here. By Rail: Chidambaram is located on the Madras-Thiruchirapalli main line of the Southern Railway, which is connected with Thiruchirapalli, Chennai, Bangalore, Madurai, Rameswharam and Tirupati. By Road: Chidambaram is well connected by roads. Non-stop luxury buses operate from Chidambaram to Chennai.